This elongated tooth is quite substantial (208.9 grams). It is polished all the way around, with a small unpolished triangle near the base on the back (so the viewer can see what the tooth surface was like before it was polished). The concave side of the tooth is etched with a combination of stipple and line scrimshaw. Depicted is a frontier mountain man in buckskins riding his pony into the mountains, carryimg his rifle at ready and leading his pack pony and mule, both carrying his 'outfit.' It is etched in great detail, and finished with light coloring, as can be seen by clicking to the oversize picture. The tooth is 6 3/8 inches along the outer curve (5 1/2 inches top-to-bottom along a straight line). It is 1 9/16 inches across at its center. This tooth is, of course, legally sold - It is registered with the U.S. Department of Commerce as #21-230-0009. A handmade Sterling Silver base, made especially for this horizontal tooth, can be yours as an additional option. 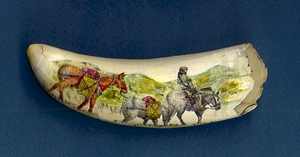 A very different piece that will appeal to afficionados of the old west, as well as scrimshaw collectors. A unique signed piece - Of course, only one is available. A distinctive addition to any collection.